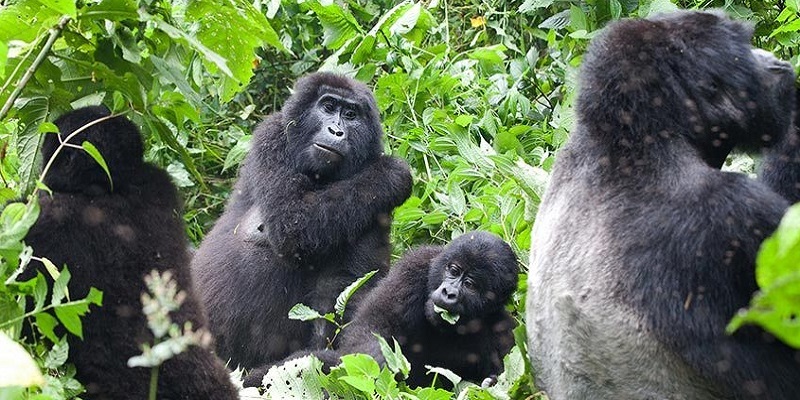 On this short 4 Days Rwanda Uganda Gorillas and Primates Tour, you not only get to trek with the Gorillas but also the rare Golden Monkeys of Rwanda and get to experience the incredible culture of Rwanda. Get to tour Kigali City, Rwanda’s Major capital and cleanest city in Africa, located in the heart of the country, which is actually 6 hours closer to Bwindi, giving you an ultimate thrilling adventure to combine this tour to Uganda for a gorilla trekking activity. Actually, most travellers prefer to trek Ugandan gorilla from Kigali because it is quite nearer and affordable to reach Bwindi from Kigali than it is from the Kampala, capital of Uganda. It’s the perfect blend of best access, animal encounters and culture. This tour is the best of both worlds and two countries in only 4 Days. Bwindi Impenetrable Forest National Park is home to over 1/3 of the remaining 1000 Mountain Gorillas in the world and home to some of the most special animal encounters on the planet. Uganda is the only country in the world that can brag to have it all. Some of the activities on this tour include; gorilla tracking adventures, primates trekking expeditions, Cultural excursions, nature walks, golden monkey tracking, just a few here, come and explore more with us! 3 Dinners, 3 Lunches and 3 Breakfasts. 1 Night accommodation at Kigali Marriott Hotel. 1 x Dinner in Kigali on final day. Welcome to Kigali, Rwanda. Our tour representative and your driver/guide will meet you at the arrivals hall at Kigali International and warmly welcome, introduce themselves and transfer you to your hotel. After breakfast at your accommodation we head off on the scenic 4.5-hour drive to Bwindi Impenetrable Forest, Uganda. Enroute you will discover why Rwanda is called The Land of a Thousand Hills as the drive is very scenic and continues in to Uganda as you will get to see all 5 Volcano Peaks of the border park and marvel in the farmers working on the steep terraced hills. After checking in and having lunch we will head off to the nearby Batwa Experience. The Batwa people where the original inhabitants of the forests of Bwindi and their lineage is thought to go back possibly 5000 years. The Batwa have been displaced since the early 1990’s and these re-enactments in the forest are their way of preserving their culture and passing it down to current generations. There will be plenty of Batwa present who remember their days as forest dwelling nomads. Their bush skills and stories are unique and extremely interesting. Their small stature is thought to be an adaptation to their forest surrounds. After the Batwa we will retire for dinner and overnight at your accommodation. Musanze, Volcanoes National Park, Rwanda. Dinner and overnight at your accommodation of choice at Da Vinci Gorilla Lodge, Mountain Gorilla View Lodge, Sabyinyo Sliverback Lodge or Ingagi Park View Lodge. DAY 4: GOLDEN MONKEY TREK AND TRANSFER TO KIGALI. After and early breakfast we leave for the Golden Monkey Trek at 7am. Golden Monkeys are very rare and nowhere in Africa is there better access to large habituated numbers than in Rwanda. These unique, playful and beautiful creatures will entertain you for a good hour and the trek on average is normally much easier than the Gorilla Trek. After the trek return to your lodge for a freshen up and check out at approximately 10:30am. Your departing flight doesn’t leave until the evening so now we will transfer you to Kigali and use our remaining time to experience a city tour of Kigali and host a farewell dinner before transferring to the airport for your evening flight. On arrival we will have lunch at Hotel Des Mill Collines, known more famously as Hotel Rwanda before taking you to the Kigali Genocide Memorial. This educational, transparent and very moving memorial will take you through the causes, build up, the tragedy itself and the incredibly inspiring reconciliation and rebuilding in the years since. From this moving experience we then take lunch and then visit Nyamirambo Women’s Centre. Here we do an interesting walking tour of Kigali and see the real and interesting sites of every day Rwandan’s. As your flight is a late evening flight we will take you to dinner at one of Kigali’s very good restaurants before transferring you to Kigali Airport for your onward flight. We wish you safe travels and many fond memories.